Where Do Radiology Nurses Work? What Is a Radiology Nurse? A radiology nurse, also referred to as a medical imaging nurse, is a nursing professional that cares for patients that must undergo diagnostic imaging procedures and radiation therapy. Common diagnostic imaging tests include x-rays, computed tomography scans (CT scans), magnetic resonance imaging scans (MRIs), and ultrasounds. Through the use of these imaging tests, medical professionals are able to see inside a patient's body, enabling them to easily diagnose illnesses and suspected injuries. Radiation therapy is also commonly used to treat certain illnesses, such as cancer. In order to provide proper care, radiology nurses not only focus on patient comfort, but ensure that accurate images are being taken to help diagnose these injuries and illnesses. The first step towards any career in nursing is becoming a licensed registered nurse. While an Associate of Science in Nursing (ADN) is the minimal requirement, many employers prefer applicants with a Bachelor's of Science in Nursing (BSN). An ADN typically takes two years to complete, while a BSN takes around four years. Upon completing either program, one must then pass the National Council Licensure Examination for Registered Nurses (NCLEX-RN). What Are the Education Requirements for Radiology Nurses? While RNs with either an ADN or BSN can work in the radiology field, those with a BSN will find it much easier to find work in the specialty. 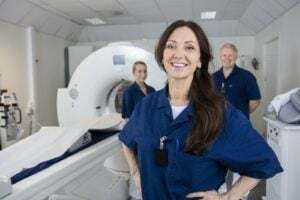 With that said, although radiology nurses are often hired at the registered nurse level, with advanced education and experience, nurse practitioners and clinical nurse specialists serve as mid-level providers within radiology departments. In order to practice advanced specialty in radiology, one must achieve a Master's of Science in Nursing (MSN) or a Doctor of Nursing Practice (DNP) degree as a Family Nurse Practitioner, an Adult Nurse Practitioner, or a Clinical Nurse Specialist. Additional certifications are offered for radiology nurses by the Association for Radiologic & Imaging Nurses. Upon completing 2,000 hours of experience in radiology and a minimum of at least 30 hours of additional education in radiology, the registered nurse will then be eligible to take the Certified Radiology Nurse exam. A radiology nurse works as a member of a larger team of medical professionals, including physicians, specialists, other nurses, and radiology technicians. As radiology nurses work in conjunction with other healthcare professionals, being able to effectively communicate is essential. With the amount of collaboration between other medical professionals and a high turnover in patients, one must be easily adaptable. A radiology nurse is primarily responsible for the assessment, planning, and care of patients who undergo diagnostic and therapeutic procedures. Due to great advancements in radiologic medical technology, a radiology nurse must have a high level of technical expertise and knowledge. What Are the Roles and Duties of a Radiology Nurse? As the field of radiology and diagnostic imaging is a rapidly advancing area of healthcare, the employment outlook remains high. Radiology plays a pivotal role in diagnosing, managing, and treating a variety of conditions and diseases, meaning that employment in hospitals and/or diagnostic image facilities are always in demand. The average salary for a radiology nurse is $62,107 annually, whereas a nurse practitioner in radiology earns $90,583 annually.